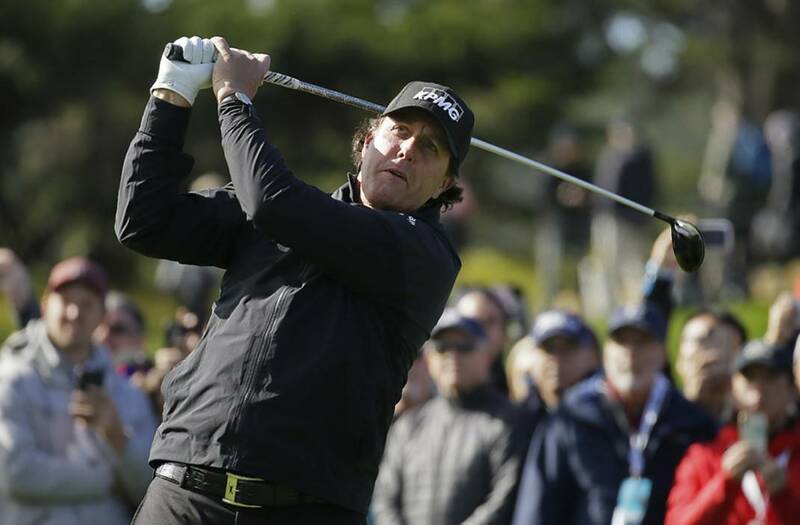 Phil Mickelson follows through and tracks his drive from the fourth tee at Pebble Beach Golf Links during the final round of the AT&T Pebble Beach Pro-Am on Sunday. The round was not completed, but Mickelson was in the lead. Casey simply couldn't see, and when Mickelson realized it was not possible to finish all 18 holes — "We can't finish two holes in six minutes," he said to the official — he opted to mark his ball on the 16th green. Mickelson already made his par on the 16th and was 6 under for the day, with no bogeys on his card, and 18 under for the tournament. Casey needs to make a three-foot par putt to stay three shots behind when they return at 8 this morning to play the par-3 17th and the par-5 18th. Lost in the late start — a one-hour delay from rain, plus a two-hour suspension from hail — was sheer brilliance from the 48-year-old Mickelson, who didn't come remotely close to making a bogey and was on the brink of a fifth victory in the event on the Monterey Peninsula. His first one also had a Monday finish — when players returned in August, more than six months later, to complete the third round of the weather-plagued tournament to make it official. "We've got two tough holes left, and I don't want to jump the gun and get past that," Mickelson said. "I know a lot can happen in these two holes and they have happened in the past, so I want to stay focused and just come out tomorrow and try to finish it off. I wish we could do it tonight." Mickelson made his big run starting with a 9-iron shot that put the ball a foot behind the cup on the par-4 ninth. That was the start of a five-hole stretch in which Mickelson made three birdies and Paul Casey had two bogeys, taking Lefty from two behind to three ahead. Casey was at 15 under, tied with Scott Stallings, who closed with a 66. Along with an outside chance at forcing a playoff, finishing alone in second instead of a tie is a difference of $152,000, along with World Golf Ranking and FedEx Cup points. Casey and FedEx executive Don Colleran had a one-shot lead in the pro-am. Some players finished in the dark with no chance of winning, but they showed the effect of playing without light. Scott Piercy had a 15-foot putt that was slightly uphill, and he still ran it seven feet by the hole and three-putted for bogey. BOCA RATON, Fla. — Bernhard Langer made himself at home in the PGA Tour Champions' Oasis Championship. Playing 10 minutes from his house, the 61-year-old German star closed with a 7-under 65 in windy conditions at The Old Course at Broken Sound for a five-stroke victory. He finished at a tournament-record 19-under 197 for his 39th victory on the 50-and-older circuit and earned $255,000 to break Hale Irwin's tour career winnings record with $27,196,504. Also the tournament winner in 2010, Langer moved within six of Irwin's tour victories record and won in his 13th straight season to extend his record streak. Langer birdied five of the first seven holes in a bogey-free round to close in commanding fashion. Marco Dawson was second after a 69, Bob Estes shot a 68 to finish third at 13 under and David Toms was another stroke back after a 70. Chattanooga's Gibby Gilbert III closed with a 71 and tied for 42nd at 2 under in his first event of his first full season on the senior tour. BARWON HEADS, Australia — France's Celine Boutier won the ISPS Handa Vic Open for her first LPGA Tour title, closing with a par round of 72 for a two-stroke victory at 13th Beach Golf Links. Boutier finished at 8-under 281 to become the fourth French winner in LPGA Tour history. The 25-year-old former Duke University golfer also won the Ladies European Tour's 2017 Sanya Ladies Open and the 2018 Australian Ladies Classic Bonville. Australia's Sarah Kemp (65) and Su Oh (74) and England's Charlotte Thomas (69) tied for second. Third-round leader Kim Kaufman of the United States had a 78 to tie for eighth at 4 under. The tournament was played alongside a men's event sanctioned by the European Tour and the PGA Tour of Australasia. Scotland's David Law overcame a three-stroke deficit on the final three holes to top that field for his first European Tour title. Law birdied the par-4 16th and made an eight-foot eagle putt on the par-5 18th for a 6-under 66 and a one-stroke victory over Australia's Brad Kennedy (67) and Wade Ormsby (70), who had a double bogey on the par-3 17th. PANAMA CITY — Canada's Michael Gligic closed with a 5-under 65 for a one-shot victory in the Web.com Tour's Panama Championship, his first win in nearly seven years. Gligic was one shot behind when he opened the back nine, but he took the lead for good over China's Zhang Xinjun with a birdie on the par-4 14th hole. Each made a bogey on the 15th, and Gligic extended his lead with another birdie on the 16th. Gligic finished at 8-under 272 overall. His only other victory as a pro was on the Mackenzie Tour in Canada in 2012. Zhang birdied the last hole for a 66 to finish second, with countryman Carl Yuan (69) another stroke back. Ben Taylor, who had a one-shot lead going into the final round, didn't make a birdie until the 16th hole and closed with a 71 to finish fourth at 5 under.